#WhittierFire | California | Newly Reported! NEAR GOLETA, CALIFORNIA | A wildfire is burning near Goleta, California from an unknown cause that began on July 8, 2017. It is burning on both sides of the Ynez Mountains that is located South of Highway 154 in the Lake Cachuma (Santa Barbara County) area.. The wildfire started on July 8, 2017, from an unknown cause is about 11 miles NE of Goleta, and burning on the Los Padres National Forest. Its cause is unknown but is being thoroughly investigated by Law Enforcement agencies. The fire has scorched 11,823 acres of chaparral and brush. Fire crews have reached a successful containment of 48%. NOTE : When 100% contained has been reached, it does not necessarily mean the full is completely out. Wildland firefighters will be working to continue to suppress and contain this wildfire until it is completely out. There are 721 personnel assigned to this incident. There are 21 crews, 97 engines and 8 helicopters attached. Fire behavior is moderate with uphill runs, backing and flanking. Structures and energy infrastructure is still being currently threatened. The wildfire has destroyed 8 residential structures and 12 outbuildings. The cost for fire suppression and containment costs-to-date is $2.3 Million. The American Red Cross is currently staffing a Shelter at the San Marcos High School, located at 4750 Hollister Avenue in Goleta, California. Santa Barbara Humane Society has a shelter open for people and their pets at 5399 Overpass Road in Santa Barbara, California. A 2nd Alarm wildfire is burning near Big Bear in California that started from an unknown cause now being reported around 1500 hours. Just moments ago, (1900 hours) that the AA has just reported fire has consumed up to 1000 acres with a 0% containment status. The fire behavior is said to be extreme with a high rate of spread. The Incident Command Post (ICP) is located at Baldwin Lake. Resources include: 18 Engines, 9 Water Tenders, 16 Hand-crews, 1 Dozer, 8 Air Tankers, including tanker 911 (VLAT), 6 Helicopters. The Night Flying Air-Attack has been ordered. There are conflicting releases from various sources, saying that there were voluntary evacuations of several areas – while another says there are no evacuations at this time. * Highway 18 is closed between Baldwin Lake Road north to the Mitsubishi Plant Road. *Van Duesen Canyon 3N16 at 3N09 Road. *Holcomb Valley Rd East closed at Hwy 18 3N69 at Hwy 18. 1940 PDT: 81*F temps with 32% RH. Winds are 3 mph. the dewpoint is 48%. The Heat Index is 80*F and there is a 10 mile visibility. then slight increase in temperatures this weekend. The fire can been seen from Victor Valley and from the Big Bear Golf Course. Some have reported seeing black smoke from Gold Mountain, North of Big Bear Valley toward Baldwin Lake. FIRE IC has been notified of dynamite in a local Holcomb Valley mine located in the San Bernardino Mountains which is about 5 miles North of Big Bear Lake. Years ago, the Holcomb Valley area was deemed the site of the most gold mines in Southern California. FIRE IC will notify firefighters to stay away from this area. We are reporting this fire as #BigBearFire but there are other media outlets using #BigBearFire as well. USA, UK, Canada, India, Vietnam, Brazil, Tanzamania, Hungary, Spain, Lithuania, Denmark, Bangladesh, Ireland and Nigeria. Thank you for reading our Blog today. A 2nd alarm wildfire is raging just North of Highway 38 and North Shore Drive in Holcomb Valley, which is East of Big Bear Lake in California. 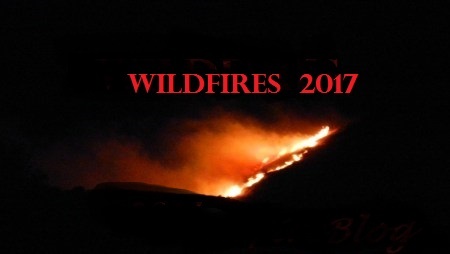 The wildfire began on Monday, June 19, 2017, around 1700 hours from an unknown cause. Fire has increased to 450-500 acres with extreme fire behavior with a fast rate of spread. There is a 0% containment status. The Pacific Crest Trail has been closed West of Highway 18. Resources are responding from Big Bear FD, Big Bear Sheriff Office, CAL Fire – BDU and San Bernardino National Forest. 7 Air Tankers, 6 helicopters, 1 AA and 1 VLAT on order. Additional resources are being called in for mutual aid (@1714 PDT). Incident Command Post (ICP) is located at Baldwin Lake. Current weather conditions (as of 1720 PDT) are 86*F, sunny, winds are 5 mph from the SE with gusts up to 23 mph. Evacuations are being prepared or may be in effect for those near the Big Bear dump and for residents in the Baldwin Lake area. Social Media – We are reporting this fire as #BigBearFire but there are other media outlets using #BigBearFire as well. Shoutouts to – USA, UK, Canada, India, Vietnam, Brazil, Tanzamia, Hungary, Spain, Lithuania, Denmark, Bangladesk, Ireland and Nigeria. Thank you for reading our Blog today. 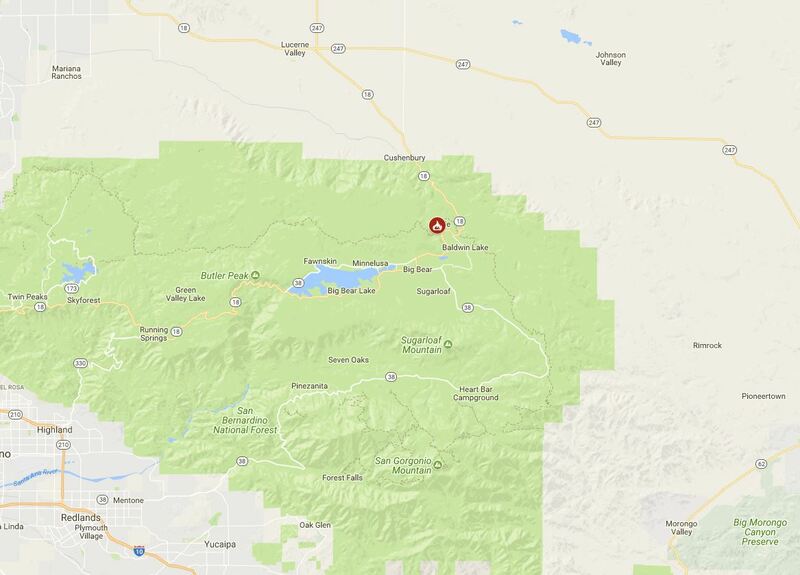 Fire incident – A 2nd alarm wildfire is raging just North of Highway 38 and North Shore Drive in Holcomb Valley, which is East of Big Bear Lake in California. There has been 200+ acres already destroyed with the fire burning heavy timber. Fire behavior is extreme with a fast rate of spread. Some are speculating this fire could consume up to 1,000 acres! Closures – None at this time but this is a fluid work-in-progress. Resources – Resources are responding from Big Bear FD, Big Bear Sheriff Office, CAL Fire – BDU and San Bernardino National Forest. 7 Air Tankers, 2 medium and 1 helicopter have been ordered. 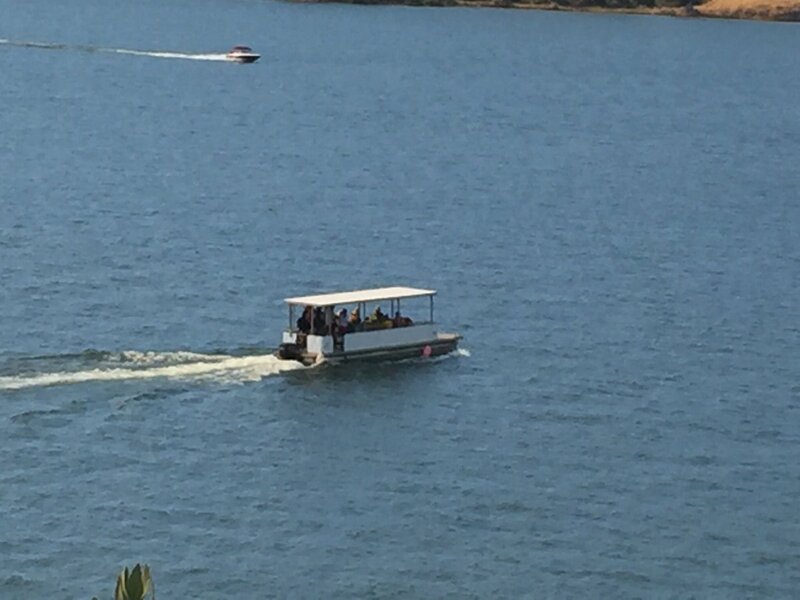 Fire Weather – Current weather conditions are 87*F temps, 14% RH, Winds at 5-10 mph with a dew point of 32%. The heat index is at 83*F temps. Observations – The fire can been seen from Victor Valley and from the Big Bear Golf Course. Some have reported seeing black smoke from Gold Mountain, North of Big Bear Valley toward Baldwin Lake. Evacuations – Evacuations are being prepared or may be in effect for those near the Big Bear dump and for residents in the Baldwin Lake area. Threats – Though evacuations are in effect, there are reports of no current structures being under direct threat. Hazards – FIRE IC has been notified of dynamite in a local Holcomb Valley mine located in the San Bernardino Mountains which is about 5 miles North of Big Bear Lake, was deemed the site of the most gold mines in Southern California. FIRE IC will notify firefighters to stay away from this area. Incident Summary – A fast-moving fire that started on Saturday, June 17, 2017, on the north shoreline of Castaic Lake in California became an inferno burning to the NE into the forest. The original fire call in the afternoon was at a small 3-5 acres turned into one of the most difficult fast-moving fires in recent times remembered. As of Sunday, June 18, 2017, the fire has destroyed 1,000 acres though firefighters have reached a 10% containment status with 2 outbuildings being demolished. Cause – The cause is unknown at this time. 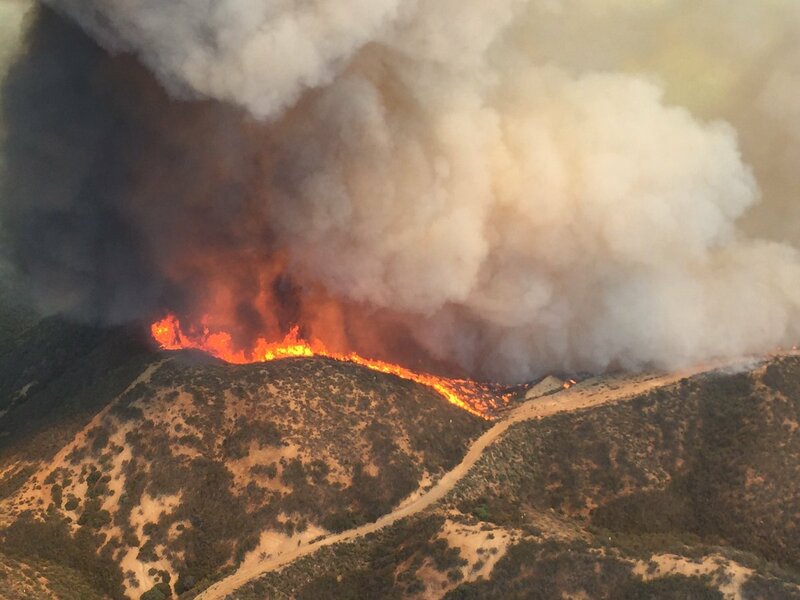 Resources – There are 450 firefighters from the Los Angeles County FD, Los Angeles City FD, Angeles National Forest, U.S. Forest Service, BLM and CA DOF & Fire Management joined together in a massive force. Equipment and resources in the form of Air Tankers, Helicopters, Helco, Fire crews, Handcrews, Water Tenders among other high volumes of resources. The Los Angeles County Sheriff’s Office was on hand to help with Law Enforcement objectives. Los Angeles County FD and the Angeles National Forest are still in Unified Command. Conditions – Access to the fire was difficult and lifeguard boats were used to shuttle crews back and forth to/from the fire on the Angeles National Forest. Grass and brush are considered as light to medium fire fuel. Containment Status – Fire crews have now reached a 10% containment status with the heavy presence of crews, strike teams, skillfully planned operations by Fire Managers and large volume of air resources. Injuries – None have been reported at this time. Social Media – Hashtags #CAwildfires2017 #LakeFire are being used for this incident. 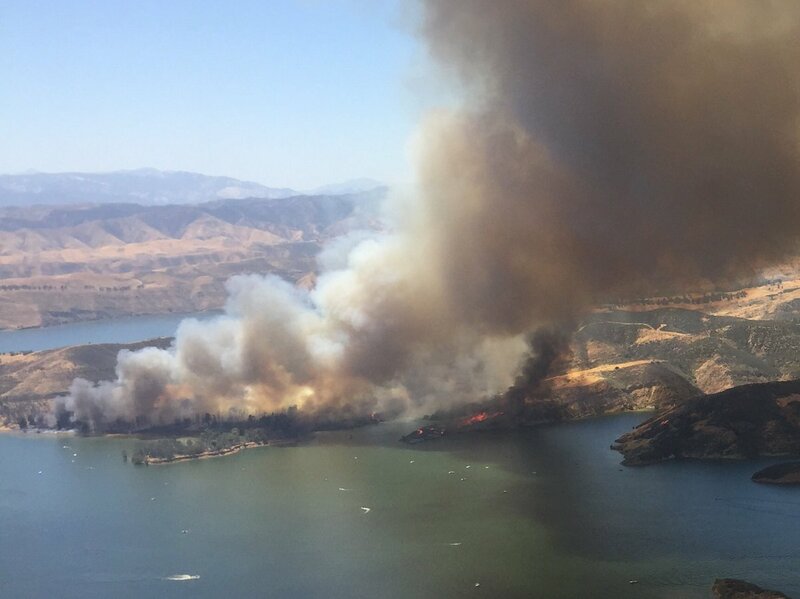 Incident Summary – A fast-moving and well-established wildfire is burning on the West side of Castaic Lake on the shoreline (as seen in the above photo) in Castaic (Los Angeles County) and north of Santa Clarita in California. Resources – Scores of resources poured in from Los Angeles County FD, Los Angeles City FD, Angeles National Forest, CAL Fire and the US Forest Service. Copters, Air Tankers and other aircraft were working around the lake and further away. 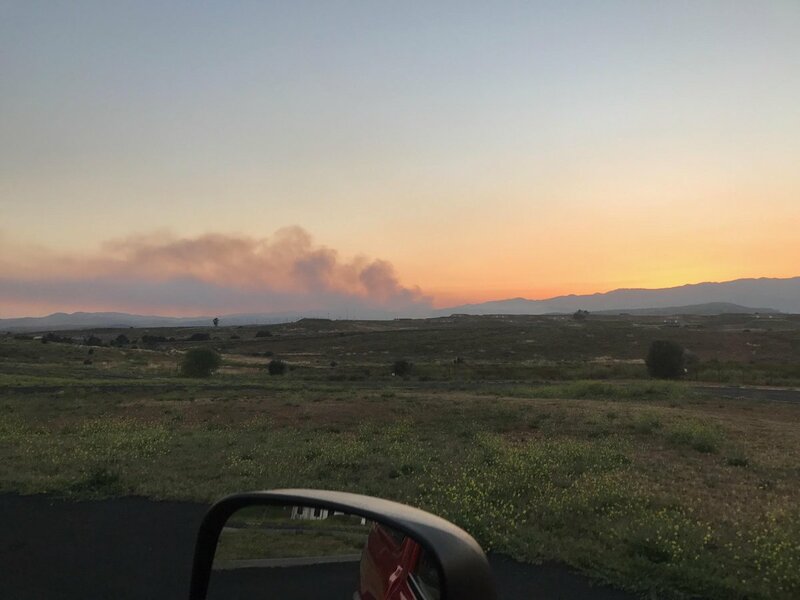 Fire Behavior – When the fire was reported, it was initially at 3-5 acres but would quickly turn into 500 acres with a short amount of time. As of this report, fire has destroyed 1,000 acres and 2 outbuildings. Operations – Night operations will continue throughout the evening on Saturday, June 17th into Sunday, June 18th when some resources are due to be reassigned to this wildfire. Resources – 2 #CDF S-2 Tankers 72 & 73 were on-scene. A strike team was requested and to meet on I-5 as part of staging. LA County Fire Ops (helicopters) are working in conjunction with LA County ground firefighters. Conditions – Access to the fire is difficult and firefighters are having to go to Temple Highway and go through the power plant. Head of the fire was visible from Torrey Peak south of Piru. Fire Behavior – The shoreline fire has destroyed 3-5 acres with moderate rate of spread (ROS) with spotting. Fire is now threatening SR8 and structures in this area.